A previous blog post “Picking up the PACE and Running with City Charters: An Update on Municipal Government Act” introduced Bill 10: An Act to Enable Clean Energy Improvements which amended the Municipal Government Act to enable Property Assessed Clean Energy (PACE) programs. PACE programs are designed to lower the up-front costs of clean energy upgrades through loans issued to citizens interested in making energy efficiency and clean energy upgrades to their property. In Alberta, this is done through entering into an agreement with the municipality and the repayment of the loan occurs through a municipal tax. The loans can be issued by either an independent finance company or by a municipality. The payment of the clean energy improvement tax (i.e. the loan and associated costs) is the responsibility of the owner of the home (regardless of who initially entered into the agreement). An Act to Enable Clean Energy Improvements provided the foundation for a PACE program, however, the Act did not include any details for the administration of such a program. The first release of these details came recently, in the form of the Clean Energy Improvements Regulation. 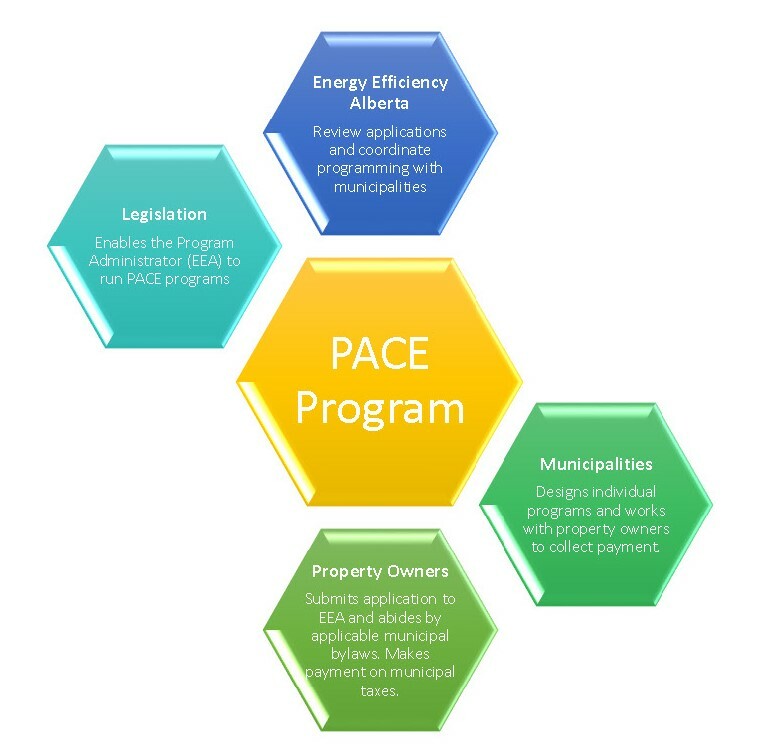 On the PACE information website, the Government of Alberta states that although municipalities can devise their own individual PACE programs, municipalities may also work with Energy Efficiency Alberta to implement a program and deliver it to residents. To enable this partnership, the regulation begins by appointing Energy Efficiency Alberta, or other entities as may be designated by the Minister, as the PACE program administrator. The regulation states that it is the job of the program administrator, generally Energy Efficiency Alberta, to create a list of renovations, adaptations, or installations that are eligible for a clean energy improvement agreement (“eligible services”). All eligible services will be published on the Energy Efficiency Alberta website. It is also the job of the program administrator to create and publish a list of persons that may provide the eligible services – known under the regulation as “qualified contractors”. The program administrator will also establish and publish a code of conduct; marketing guidelines; and a policy for the removal of a qualified contractor from the approved list. The regulation sets out specific criteria that must be included in both the code of conduct and the marketing guideline. In addition to these criteria, qualified contractors must also enter into an agreement with the program administrator. This agreement is designed to protect both the contractor and the consumer during the installation process. The agreement must require that all installed products, and eligible services come with a manufacturer’s warranty consistent with industry standards and that this warranty is transferable to any subsequent property owners; must require that the contractor provides a warranty for defects in materials and labour; and must establish a dispute resolution process. Municipalities wishing to participate in a PACE program must pass a clean energy improvement tax bylaw (“PACE bylaw”). The PACE bylaw is further described in the regulation. The PACE bylaw must indicate that a clean energy improvement tax may be imposed on any property subject to a clean energy improvement agreement at any time following the signing of the agreement. The PACE bylaw can only apply to eligible services as listed by the program administrator. Once the PACE bylaw is in place, municipalities must then enter into an agreement with the program administrator setting out guidelines for the administration of the program in that municipality. Specifically, this agreement must determine how the administration fees gathered through applications will be divided between the municipality and the program administrator. Applications for clean energy improvements may have application fees associated with them. These fees are capped at $100 for residential properties; $500 for non-residential properties; and $200 for farm land. Once an application and any associated fees have been submitted, the program administrator may approve the application, if the administrator is satisfied that all requirements of the Act, regulation, and bylaw have been met. Approved applications are then provided to both the applicant and the municipality. (d) there is written approval from a building owner if the clean energy improvement is being proposed for a shared building and the improvement will affect any of the shared facilities. The program administrator can also require a technical assessment or an energy audit of a property and can require that the property be inspected prior to assessing any applications. Finally, applicants must be able to demonstrate that they are in good standing with respect to municipal taxes. This check provides assurance that the assignment of a loan to a property owner’s municipal taxes will not result in defaulted payments. Once an application has been approved, property owners must enter into a clean energy improvement agreement with their municipality. To do so, the property owner must demonstrate that: (1) the program administrator has approved the application; (2) the value of the capital costs of the project does not exceed limits set out in the regulation; and (3) the amount of tax most recently imposed on the property is greater than, or equal to, the annual payment for the clean energy improvement – a formula to determine this is included in the regulation. If these requirements are met, a clean energy improvement agreement can be created. (h) that the agreement may be rescinded for 10 days following signing. Due to the fact that clean energy improvements, and their associated debt, run with the property upon sale or transfer, the regulation also sets out requirements for disclosure and transfer documents at the time of sale. Despite this option, the PACE legislation does allow for the repayment of a PACE loan in its entirety, at any time. This means that payment of a PACE loan may be used as a negotiating tactic during the sale of a property and the connection between a property and the cost of its clean energy improvements may not always exist. Finally, the regulation sets up a monitoring and reporting system under which the program administrator releases an annual report on any programs established by municipalities, focused on costs savings and emissions reductions. This new regulation sets out many of the details required for a more robust PACE program and with it the basic framework of the legislation and regulation has been passed. The next step is likely for municipalities to decide whether they will opt in to this voluntary program and if they decide to do so, to keep up the pace and pass their respective clean energy improvement tax bylaws. Bill 10, An Act to Enable Clean Energy Improvements, 4th Sess, 29th Leg, Alberta, 2018 (assented to 11 June 2018) [Bill 10]. Municipal Government Act, RSA 2000, c M-26, s 390.5 [MGA]. Clean Energy Improvements Regulation, Alta Reg 212/2018 [Clean Energy Improvements Regulation]. Government of Alberta, “Property Assessed Clean Energy (PACE) legislation” online: https://www.alberta.ca/PACE.aspx. Clean Energy Improvements Regulation, s 2. Clean Energy Improvements Regulation, s 3. Clean Energy Improvements Regulation, s 4(1). Clean Energy Improvements Regulation, s 4(2). Clean Energy Improvements Regulation, ss 4(3) & (4). Clean Energy Improvements Regulation, s 11(1). Clean Energy Improvements Regulation, s 11(2). Clean Energy Improvements Regulation, s 5. Clean Energy Improvements Regulation, s 5(2). Clean Energy Improvements Regulation, s 6(1). Clean Energy Improvements Regulation, s 6(2). Clean Energy Improvements Regulation, s 8(2). Clean Energy Improvements Regulation, s 9(3). Clean Energy Improvements Regulation, s 9(4). Clean Energy Improvements Regulation, s 7(1). Clean Energy Improvements Regulation, s 7(2). Clean Energy Improvements Regulation, s 7(3). Clean Energy Improvements Regulation, s 7(4). Clean Energy Improvements Regulation, ss 10(1)(a)(b) & (c). Clean Energy Improvements Regulation, s 10(4). Clean Energy Improvements Regulation, s 10(6). Clean Energy Improvements Regulation, ss 11(1) & (2). The Environmental Law Centre (ELC) has been seeking strong and effective environmental laws since it was founded in 1982. The ELC is dedicated to providing credible, comprehensive and objective legal information regarding natural resources, energy and environmental law, policy and regulation in Alberta. The ELC’s mission is to educate and champion for strong laws and rights so all Albertans can enjoy clean water, clean air and a healthy environment. Our vision is a society where laws secure an environment that sustains current and future generations. As a charity, the Environmental Law Centre depends on your financial support. Help us to continue to educate and champion for strong environmental laws, through tools such as our blog and all of our other resources, so that all Albertans can enjoy a healthy environment. Your support makes a difference.